Comparison of the Pistol Star, Rho Cassiopeiae, Betelgeuse, and VY Canis Majoris superimposed on an outline of the Solar System. The blue half-ring centered near the left edge represents the orbit of Neptune, the outermost planet. A hypergiant (luminosity class 0 or Ia+) is among the very rare kinds of stars that typically show tremendous luminosities and very high rates of mass loss by stellar winds. The term hypergiant is defined as luminosity class 0 (zero) in the MKK system. However, this is rarely seen in the literature or in published spectral classifications, except for specific well-defined groups such as the yellow hypergiants, RSG (red supergiants), or blue B(e) supergiants with emission spectra. More commonly, hypergiants may be classed as Ia-0 or Ia+, but red supergiants are rarely assigned these spectral classifications. Astronomers are interested in these stars because they relate to understanding stellar evolution, especially with star formation, stability, and their expected demise as supernovae. In 1956, the astronomers Feast and Thackeray used the term super-supergiant (later changed into hypergiant) for stars with an absolute magnitude brighter than MV = −7 (MBol will be larger for very cool and very hot stars, for example at least −9.7 for a B0 hypergiant). In 1971, Keenan suggested that the term would be used only for supergiants showing at least one broad emission component in Hα, indicating an extended stellar atmosphere or a relatively large mass loss rate. The Keenan criterion is the one most commonly used by scientists today. To be classified as a hypergiant, a star must be highly luminous and have spectral signatures showing atmospheric instability and high mass loss. Hence it is possible for a non-hypergiant, supergiant star to have the same or higher luminosity as a hypergiant of the same spectral class. Hypergiants are expected to have a characteristic broadening and red-shifting of their spectral lines, producing a distinctive spectral shape known as a P Cygni profile. The use of hydrogen emission lines is not helpful for defining the coolest hypergiants, and these are largely classified by luminosity since mass loss is almost inevitable for the class. Stars with an initial mass above about 25 M☉ quickly move away from the main sequence and increase somewhat in luminosity to become blue supergiants. They cool and enlarge at approximately constant luminosity to become a red supergiant, then contract and increase in temperature as the outer layers are blown away. They may "bounce" backwards and forwards executing one or more "blue loops", still at a fairly steady luminosity, until they explode as a supernova or completely shed their outer layers to become a Wolf–Rayet star. Stars with an initial mass above about 40 M☉ are simply too luminous to develop a stable extended atmosphere and so they never cool sufficiently to become red supergiants. The most massive stars, especially rapidly rotating stars with enhanced convection and mixing, may skip these steps and move directly to the Wolf–Rayet stage. This means that stars at the top of the Hertzsprung–Russell diagram where hypergiants are found may be newly evolved from the main sequence and still with high mass, or much more evolved post-red supergiant stars that have lost a significant fraction of their initial mass, and these objects cannot be distinguished simply on the basis of their luminosity and temperature. High-mass stars with a high proportion of remaining hydrogen are more stable, while older stars with lower masses and a higher proportion of heavy elements have less stable atmospheres due to increased radiation pressure and decreased gravitational attraction. These are thought to be the hypergiants, near the Eddington limit and rapidly losing mass. The yellow hypergiants are thought to be generally post-red supergiant stars that have already lost most of their atmospheres and hydrogen. A few more stable high mass yellow supergiants with approximately the same luminosity are known and thought to be evolving towards the red supergiant phase, but these are rare as this is expected to be a rapid transition. Because yellow hypergiants are post-red supergiant stars, there is a fairly hard upper limit to their luminosity at around 500,000–750,000 L☉, but blue hypergiants can be much more luminous, sometimes several million L☉. Almost all hypergiants exhibit variations in luminosity over time due to instabilities within their interiors, but these are small except for two distinct instability regions where luminous blue variables (LBVs) and yellow hypergiants are found. Because of their high masses, the lifetime of a hypergiant is very short in astronomical timescales: only a few million years compared to around 10 billion years for stars like the Sun. Hypergiants are only created in the largest and densest areas of star formation and because of their short lives, only a small number are known despite their extreme luminosity that allows them to be identified even in neighbouring galaxies. The time spent in some phases such as LBVs can be as short as a few thousand years. As the luminosity of stars increases greatly with mass, the luminosity of hypergiants often lies very close to the Eddington limit, which is the luminosity at which the radiation pressure expanding the star outward equals the force of the star's gravity collapsing the star inward. This means that the radiative flux passing through the photosphere of a hypergiant may be nearly strong enough to lift off the photosphere. Above the Eddington limit, the star would generate so much radiation that parts of its outer layers would be thrown off in massive outbursts; this would effectively restrict the star from shining at higher luminosities for longer periods. A good candidate for hosting a continuum-driven wind is Eta Carinae, one of the most massive stars ever observed. With an estimated mass of around 130 solar masses and a luminosity four million times that of the Sun, astrophysicists speculate that Eta Carinae may occasionally exceed the Eddington limit. The last time might have been a series of outbursts observed in 1840–1860, reaching mass loss rates much higher than our current understanding of what stellar winds would allow. As opposed to line-driven stellar winds (that is, ones driven by absorbing light from the star in huge numbers of narrow spectral lines), continuum driving does not require the presence of "metallic" atoms — atoms other than hydrogen and helium, which have few such lines — in the photosphere. This is important, since most massive stars also are very metal-poor, which means that the effect must work independently of the metallicity. In the same line of reasoning, the continuum driving may also contribute to an upper mass limit even for the first generation of stars right after the Big Bang, which did not contain any metals at all. Another theory to explain the massive outbursts of, for example, Eta Carinae is the idea of a deeply situated hydrodynamic explosion, blasting off parts of the star's outer layers. The idea is that the star, even at luminosities below the Eddington limit, would have insufficient heat convection in the inner layers, resulting in a density inversion potentially leading to a massive explosion. The theory has, however, not been explored very much, and it is uncertain whether this really can happen. Another theory associated with hypergiant stars is the potential to form a pseudo-photosphere, that is a spherical optically dense surface that is actually formed by the stellar wind rather than being the true surface of the star. Such a pseudo-photosphere would be significantly cooler than the deeper surface below the outward-moving dense wind. This has been hypothesized to account for the "missing" intermediate-luminosity LBVs and the presence of yellow hypergiants at approximately the same luminosity and cooler temperatures. The yellow hypergiants are actually the LBVs having formed a pseudo-photosphere and so apparently having a lower temperature. Hypergiants are evolved, high luminosity, high-mass stars that occur in the same or similar regions of the HR diagram to stars with different classifications. It is not always clear whether the different classifications represent stars with different initial conditions, stars at different stages of an evolutionary track, or is just an artifact of our observations. Astrophysical models explaining the phenomena show many areas of agreement. Yet there are some distinctions that are not necessarily helpful in establishing relationships between different types of stars. Although most supergiant stars are less luminous than hypergiants of similar temperature, a few fall within the same luminosity range. Ordinary supergiants compared to hypergiants often lack the strong hydrogen emissions whose broadened spectral lines indicate significant mass loss. Evolved lower mass supergiants do not return from the red supergiant phase, either exploding as supernovae or leaving behind a white dwarf. Luminous blue variables are a class of highly luminous hot stars that display characteristic spectral variation. They often lie in a "quiescent" zone with hotter stars generally being more luminous, but periodically undergo large surface eruptions and move to a narrow zone where stars of all luminosities have approximately the same temperature, around 8,000K. This "active" zone is near the hot edge of the unstable "void" where yellow hypergiants are found, with some overlap. It is not clear whether yellow hypergiants ever manage to get past the instability void to become LBVs or explode as a supernova. Blue hypergiants are found in the same parts of the HR diagram as LBVs but do not necessarily show the LBV variations. Some but not all LBVs show the characteristics of hypergiant spectra at least some of the time, but many authors would exclude all LBVs from the hypergiant class and treat them separately. Blue hypergiants that do not show LBV characteristics may be progenitors of LBVs, or vice versa, or both. Lower mass LBVs may be a transitional stage to or from cool hypergiants or are different type of object. Wolf–Rayet stars are extremely hot stars that have lost much or all of their outer layers. WNL is a term used for late stage (i.e. cooler) Wolf–Rayet stars with spectra dominated by nitrogen. Although these are generally thought to be the stage reached by hypergiant stars after sufficient mass loss, it is possible that a small group of hydrogen-rich WNL stars are actually progenitors of blue hypergiants or LBVs. These are the closely related Ofpe (O-type spectra plus H, He, and N emission lines, and other peculiarities) and WN9 (the coolest nitrogen Wolf–Rayet stars) which may be a brief intermediate stage between high mass main-sequence stars and hypergiants or LBVs. Quiescent LBVs have been observed with WNL spectra and apparent Ofpe/WNL stars have changed to show blue hypergiant spectra. High rotation rates cause massive stars to shed their atmospheres quickly and prevent the passage from main sequence to supergiant, so these directly become Wolf–Rayet stars. Wolf Rayet stars, slash stars, cool slash stars (aka WN10/11), Ofpe, Of+, and Of* stars are not considered hypergiants. Although they are luminous and often have strong emission lines, they have characteristic spectra of their own. Hypergiants are difficult to study due to their rarity. Many hypergiants have highly variable spectra, but they are grouped here into broad spectral classes. Eta Carinae, inside the Carina Nebula (NGC 3372) in the southern constellation of Carina. Eta Carinae is extremely massive, possibly as much as 120 to 150 times the mass of the Sun, and is four to five million times as luminous. Possibly a different type of object from the LBVs, or extreme for a LBV. P Cygni, in the northern constellation of Cygnus. Prototype for the general characteristics of LBV spectral lines. S Doradus, in the Large Magellanic Cloud, in the southern constellation of Dorado. Prototype variable, LBVs are still sometimes called S Doradus variables. 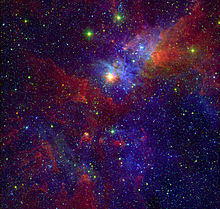 The Pistol Star (V4627 Sgr), near the center of the Milky Way, in the constellation of Sagittarius. The Pistol Star is possibly as much as 150 times more massive than the Sun, and is about 1.7 million times more luminous. Considered a candidate LBV, but variability has not been confirmed. LBV 1806-20 in the 1806-20 cluster on the other side of the Milky Way. BP Crucis (Wray 977 or GX 301-2), binary with a pulsar companion. HDE 269128 (R81 in LMC), LBV candidate, eclipsing binary system. V1429 Aquilae (= MWC 314), LBV candidate with a supergiant companion. Yellow hypergiants with late A -K spectra. Plus at least two probable cool hypergiants in the recently discovered Scutum Red Supergiant Clusters: F15 and possibly F13 in RSGC1 and Star 49 in RSGC2. M type spectra, the largest known stars. A survey expected to capture virtually all Magellanic Cloud red hypergiants detected around a dozen M class stars Mv−7 and brighter, around a quarter of a million times more luminous than the Sun, and from about 1,000 times the radius of the Sun upwards. ^ Some authors consider Cygnus OB2-12 an LBV because of its extreme luminosity, although it has not shown the characteristic variability. ^ Brightest star of the OB association Scorpius OB1 and a LBV candidate. ^ In the northern constellation of Cassiopeia, is about 500,000 times as luminous as the Sun. ^ May just be a closer post-AGB star. ^ de Jager, C. (1998). "The Yellow Hypergiants". The Astronomy and Astrophysics Review. 8 (3): 145–180. Bibcode:1998A&ARv...8..145D. doi:10.1007/s001590050009. ^ Cyril Georgy; Sylvia Ekström; Georges Meynet; Philip Massey; Levesque; Raphael Hirschi; Patrick Eggenberger; André Maeder (2012). "Grids of stellar models with rotation II. WR populations and supernovae/GRB progenitors at Z = 0.014". Astronomy & Astrophysics. 542: A29. arXiv:1203.5243. Bibcode:2012A&A...542A..29G. doi:10.1051/0004-6361/201118340. ^ Brott, I.; Evans, C. J.; Hunter, I.; De Koter, A.; Langer, N.; Dufton, P. L.; Cantiello, M.; Trundle, C.; Lennon, D. J.; De Mink, S. E.; Yoon, S. -C.; Anders, P. (2011). "Rotating massive main-sequence stars". Astronomy & Astrophysics. 530: A116. arXiv:1102.0766. Bibcode:2011A&A...530A.116B. doi:10.1051/0004-6361/201016114. ^ Owocki, S. P.; Van Marle, Allard Jan (2007). "Luminous Blue Variables & Mass Loss near the Eddington Limit". Proceedings of the International Astronomical Union. 3: 71–83. arXiv:0801.2519. Bibcode:2008IAUS..250...71O. doi:10.1017/S1743921308020358. ^ Owocki, S. P.; Gayley, K. G.; Shaviv, N. J. (2004). "A porosity-length formalism for photon-tiring limited mass loss from stars above the Eddington limit". The Astrophysical Journal. 616 (1): 525–541. arXiv:astro-ph/0409573. Bibcode:2004ApJ...616..525O. doi:10.1086/424910. ^ Smith, N.; Owocki, S. P. (2006). "On the role of continuum driven eruptions in the evolution of very massive stars and population III stars". The Astrophysical Journal. 645 (1): L45–L48. arXiv:astro-ph/0606174. Bibcode:2006ApJ...645L..45S. doi:10.1086/506523. ^ a b Vink, J. S. (2012). "Eta Carinae and the Luminous Blue Variables". Eta Carinae and the Supernova Impostors. Astrophysics and Space Science Library. 384. pp. 221–247. arXiv:0905.3338. Bibcode:2012ASSL..384..221V. doi:10.1007/978-1-4614-2275-4_10. ISBN 978-1-4614-2274-7. ^ Langer, Norbert; Heger, Alexander; García-Segura, Guillermo (1998). "Massive Stars: The Pre-Supernova Evolution of Internal and Circumstellar Structure". Reviews in Modern Astronomy. 11: 57. Bibcode:1998RvMA...11...57L. ^ Stothers, N.; Chin, C.-W. (1996). "Evolution of Massive Stars into Luminous Blue Variables and Wolf-Rayet stars for a range of metallicities". The Astrophysical Journal. 468: 842–850. Bibcode:1996ApJ...468..842S. doi:10.1086/177740. ^ De Jager, Cornelis (1998). "The yellow hypergiants". Astronomy and Astrophysics Review. 8 (3): 145–180. Bibcode:1998A&ARv...8..145D. doi:10.1007/s001590050009. ^ Vink, Jorick S. (2012). "Eta Carinae and the Luminous Blue Variables". Eta Carinae and the Supernova Impostors. Eta Carinae and the Supernova Impostors. Astrophysics and Space Science Library. 384. pp. 221–247. arXiv:0905.3338. Bibcode:2012ASSL..384..221V. CiteSeerX 10.1.1.250.4184. doi:10.1007/978-1-4614-2275-4_10. ISBN 978-1-4614-2274-7. ^ Nieuwenhuijzen, H; de Jager, C (2000). "Checking the yellow evolutionary void. Three evolutionary critical Hypergiants: HD 33579, HR 8752 & IRC +10420". Astronomy and Astrophysics. 353: 163–176. Bibcode:2000A&A...353..163N. ^ Clark, J. S.; Castro, N.; Garcia, M.; Herrero, A.; Najarro, F.; Negueruela, I.; Ritchie, B. W.; Smith, K. T. (2012). "On the nature of candidate luminous blue variables in M 33". Astronomy & Astrophysics. 541: A146. arXiv:1202.4409. Bibcode:2012A&A...541A.146C. doi:10.1051/0004-6361/201118440. ^ Robberto, M.; Herbst, T. M. (1998). "Warm Dust around Blue Hypergiants: Mid‐Infrared Imaging of the Luminous Blue Variable HD 168625". The Astrophysical Journal. 498 (1): 400–412. Bibcode:1998ApJ...498..400R. doi:10.1086/305519. ^ Humphreys, Roberta M.; Weis, Kerstin; Davidson, Kris; Bomans, D. J.; Burggraf, Birgitta (2014). "LUMINOUS AND VARIABLE STARS IN M31 AND M33. II. LUMINOUS BLUE VARIABLES, CANDIDATE LBVS, Fe II EMISSION LINE STARS, AND OTHER SUPERGIANTS". The Astrophysical Journal. 790 (1): 48. arXiv:1407.2259. Bibcode:2014ApJ...790...48H. doi:10.1088/0004-637X/790/1/48. ^ a b Groh, Jose; Meynet, Georges; Ekstrom, Sylvia; Georgy, Cyril (2014). "The evolution of massive stars and their spectra I. A non-rotating 60 Msun star from the zero-age main sequence to the pre-supernova stage". Astronomy & Astrophysics. 564: A30. arXiv:1401.7322. Bibcode:2014A&A...564A..30G. doi:10.1051/0004-6361/201322573. ^ Bianchi, Luciana; Bohlin, Ralph; Massey, Philip (2004). "The Ofpe/WN9 Stars in M33". The Astrophysical Journal. 601 (1): 228–241. arXiv:astro-ph/0310187. Bibcode:2004ApJ...601..228B. doi:10.1086/380485. ^ Sterken, C.; de Groot, M.; van Genderen, A. M. (1998). "Cyclicities in the Light Variations of Luminous Blue Variables II. R40 developing an S Doradus phase". Astronomy and Astrophysics. 333: 565. Bibcode:1998A&A...333..565S. ^ Van Genderen, A. M.; Sterken, C. (1999). "Light variations of massive stars (alpha Cygni variables). XVII. The LMC supergiants R 74 (LBV), R 78, HD 34664 = S 22 (B[e]/LBV), R 84 and R 116 (LBV?)". Astronomy and Astrophysics. 349: 537. Bibcode:1999A&A...349..537V. ^ a b c d e f g h Clark, J. S.; Najarro, F.; Negueruela, I.; Ritchie, B. W.; Urbaneja, M. A.; Howarth, I. D. (2012). "On the nature of the galactic early-B hypergiants". Astronomy & Astrophysics. 541: A145. arXiv:1202.3991. Bibcode:2012A&A...541A.145C. doi:10.1051/0004-6361/201117472. ^ a b c d Kathryn F. Neugent; Philip Massey; Brian Skiff; Georges Meynet (April 2012). "Yellow and Red Supergiants in the Magellanic Clouds". Astrophysical Journal. 749 (2): 177. arXiv:1202.4225. Bibcode:2012ApJ...749..177N. doi:10.1088/0004-637X/749/2/177. ^ a b Van Genderen, A. M.; Jones, A.; Sterken, C. (2006). "Light variations of alpha Cygni variables in the Magellanic Clouds". The Journal of Astronomical Data. 12: 4. Bibcode:2006JAD....12....4V. ^ Wolf, B.; Kaufer, A.; Rivinius, T.; Stahl, O.; Szeifert, T.; Tubbesing, S.; Schmid, H. M. (2000). "Spectroscopic Monitoring of Luminous Hot Stars of the Magellanic Clouds". 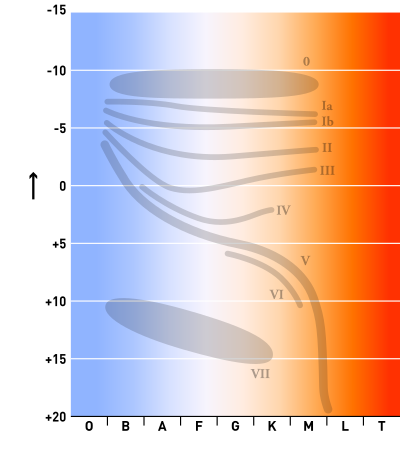 Thermal and Ionization Aspects of Flows from Hot Stars. 204: 43. Bibcode:2000ASPC..204...43W. ^ Miroshnichenko, A. S.; Chentsov, E. L.; Klochkova, V. G. (2000). "AS314: A dusty A-type hypergiant" (PDF). Astronomy and Astrophysics Supplement Series. 144 (3): 379. Bibcode:2000A&AS..144..379M. doi:10.1051/aas:2000216. ^ Stolovy, S. R.; Cotera, A.; Dong, H.; Morris, M. R.; Wang, Q. D.; Stolovy, S. R.; Lang, C. (2010). "Isolated Wolf-Rayet Stars and O Supergiants in the GalacticCenter Region Identified via Paschen-a Excess". The Astrophysical Journal. 725 (1): 188–199. arXiv:1009.2769. Bibcode:2010ApJ...725..188M. doi:10.1088/0004-637X/725/1/188. ^ a b Clark, J. S.; Negueruela, I.; Crowther, P. A.; Goodwin, S. P. (2005). "On the massive stellar population of the super star cluster Westerlund 1". Astronomy and Astrophysics. 434 (3): 949. arXiv:astro-ph/0504342. Bibcode:2005A&A...434..949C. doi:10.1051/0004-6361:20042413. ^ Lagadec, E.; Zijlstra, A. A.; Oudmaijer, R. D.; Verhoelst, T.; Cox, N. L. J.; Szczerba, R.; Mékarnia, D.; Van Winckel, H. (2011). "A double detached shell around a post-red supergiant: IRAS 17163-3907, the Fried Egg nebula". Astronomy & Astrophysics. 534: L10. arXiv:1109.5947. Bibcode:2011A&A...534L..10L. doi:10.1051/0004-6361/201117521. ^ Clark, J. S.; Negueruela, I.; Gonzalez-Fernandez, C. (2013). "IRAS 18357-0604 - an analogue of the galactic yellow hypergiant IRC +10420?". Astronomy & Astrophysics. 561: A15. arXiv:1311.3956. Bibcode:2014A&A...561A..15C. doi:10.1051/0004-6361/201322772. ^ Schuster, M. T.; Humphreys, R. M.; Marengo, M. (2006). "The Circumstellar Environments of NML Cygni and the Cool Hypergiants". The Astronomical Journal. 131 (1): 603–611. arXiv:astro-ph/0510010. Bibcode:2006AJ....131..603S. doi:10.1086/498395. ^ Jura, M.; Velusamy, T.; Werner, M. W. (2001). "What Next for the Likely Presupernova HD 179821?". The Astrophysical Journal. 556 (1): 408. arXiv:astro-ph/0103282. Bibcode:2001ApJ...556..408J. doi:10.1086/321553. ^ Levesque, E. M.; Massey, P.; Olsen, K. A. G.; Plez, B.; Meynet, G.; Maeder, A. (2006). "The Effective Temperatures and Physical Properties of Magellanic Cloud Red Supergiants: The Effects of Metallicity". The Astrophysical Journal. 645 (2): 1102–1117. arXiv:astro-ph/0603596. Bibcode:2006ApJ...645.1102L. doi:10.1086/504417.